Cornell Pump’s Municipal Market Manager, Ron Aceto, presented two sessions today at the California Water Environment Association Show. 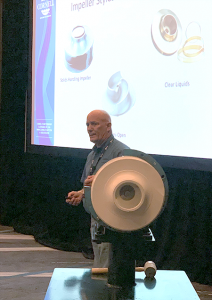 First class, on Pump Assembly / Disassembly had a standing room crowd of over 125 attendees, and the next session kept nearly the same number to hear about impeller design. We will also be showing with our distributor Tekdraulics, in booth #317, where we’ll feature our cutaway 4415T pump used in the assembly session in our booth. Come by and register for a North face jacket giveaway.